Biji-biji Initiative began with an aim to increase awareness on sustainable living. Beyond its belief in do-it-yourself principles and practices, its founders are focused on enabling the people around them to execute ideas, and then to come up with their own solutions of sustainability. ‘We started out making furniture at first, but even early on, one of our very first projects was a corporate order to make two thousand bags out of polyvinyl chloride – PVC – material. I suppose you could say we jumped into the deep end of the bag-making figurative pool,’ says Azam Hisham, co-founder. 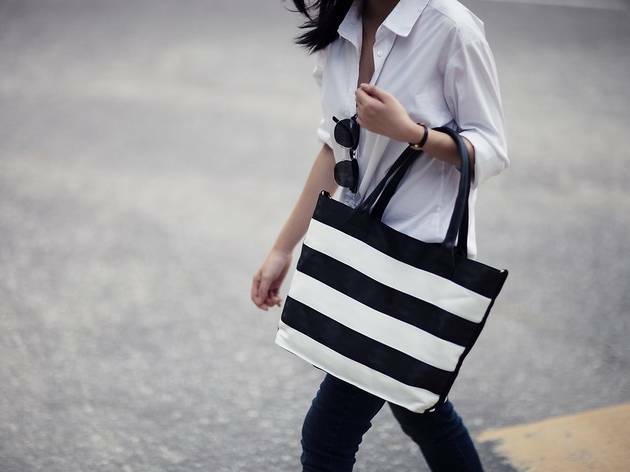 To that extent, the team recently hired Malaysian fashion designer Maatin Shakir to develop bag designs. All of Biji-biji’s products are made using at least 45 percent recycled materials – and according to Azam, other materials are sourced from local suppliers as much as is possible. There’s the Banner Bag created from discarded PVC advertising banners. Also, there are backpacks, beach bags and bucket bags made out of rejected seatbelts. ‘Recently, we’ve been working with felt – which is used as carpets at events, conferences and the like,’ says Azam. Malaysians discard banners, seat belts and felt on a weekly, even daily basis – but the waste is given a second lease of life at Biji-biji, whose designers and makers showcase creative ways to upcycle materials. ‘We’re always thinking of ideas to balance high aesthetic appeal with high environmental impact,’ Azam says. Biji-biji has a strict point-based scoring system too: every product is audited internally based on its sustainability, and measured in terms of social impact and sustainability of material and production. Biji-biji calls this the Biji Score. ‘Something that we practise here at Biji-biji is open source ideas: information sharing, idea sharing. None of our designs are copyrighted; we produce the drawings or designs of the bag, and we upload them on the internet so others can make it too. This is very true of our Banner Bag,’ Azam says. Biji-biji believes that by spreading good ideas, as a community and as a people, we can all innovate more efficiently and effectively. Plus, the more people make things out of waste, the more waste is reduced at the landfill. ‘Three years ago, from when we started making them – the Banner Bag – a lot more people have since started making them too. In fact, MBPJ does it with a single mothers’ association,’ says Azam. ‘It’s much easier to identify ethical brands than it is to identify non-ethical brands. 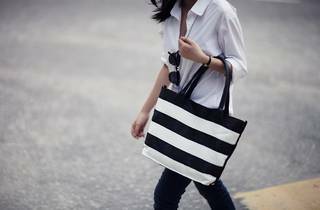 Sure, fast fashion big brands can greenwash, but if you’re a conscious consumer, you’d be looking into how they’re producing their products,’ Azam says. Fast fashion fuels rampant consumerism, pollution and waste; it’s impossible to produce planet- and people-friendly clothing at the quantity and speed that fast fashion demands, using cheap material and even cheaper labour. ‘Some [consumers] are more aware than others; they shop local labels, they’ve seen ‘The True Cost’. I like a society that has independent boutiques, independent movements – to me, that’s worth supporting,’ says Azam. ‘At this stage, we’re really still coming of age. It really is developing itself right now, especially since we started focusing on the brand as a consumer brand, an independent brand,’ Azam says. Shop Biji-biji Conscious Fashion Accessories at www.bijibijidesign.com. For more information, also visit www.biji-biji.com. 1. To address the issue of income inequality, Biji-biji has a salary cap of five times between the highest and lowest earners. 2. Biji-biji accepts waste such as bicycle wheels and pallet woods. Every now and then, they’ll make a shout-out for some specific items they’re in need of for a project. Keep a lookout to see how you can help. 3. Biji-biji is a collaborative space. If you have free time, get involved and volunteer on an ongoing project, or take on a specific project on your own.